Liberty, The American Revolution is a feature on PBS.org. There are a couple of resources in this feature that are worth noting. First, and probably the most useful, is The Chronicle of Revolution. The Chronicle of Revolution provides a timeline of events that contributed to the start of the American Revolution. Students can read newspaper accounts as they go through the chronicles. Within each newspaper account are links to further reading about important people and places mentioned in the articles. The second item of interest in Liberty, The American Revolution is the Road to Revolution game. The game isn't really a game, it's more like a quiz with some graphics added to it. 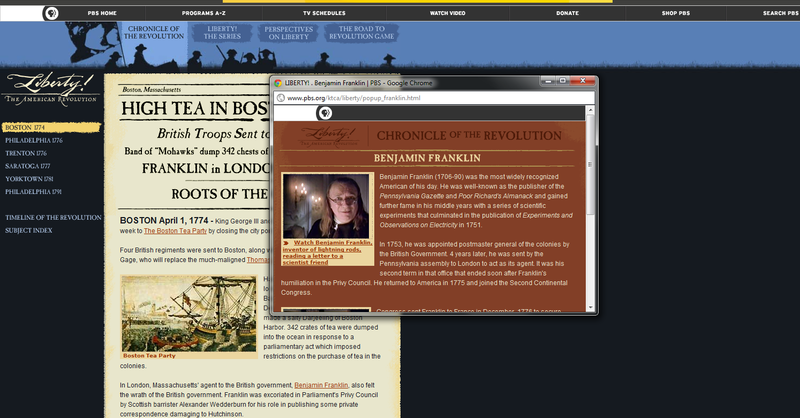 The game is designed to quiz students on the information in The Chronicle of Revolution. At this point the Chronicle of Revolution website is getting a bit dated (it was originally published in 2004), but the content on the site is still useful in supporting lessons on the American Revolution. The Chronicle of Revolution and the Road to Revolution are best suited to use with middle school students or possibly older elementary school students.